Objectives: Vascular noninflammatory molecule 1 is a plasma membrane enzyme, also known as pantetheinase. 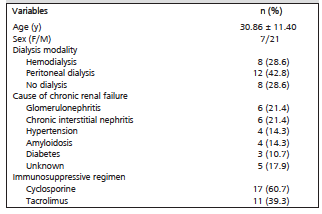 It has been shown that vascular noninflammatory molecule 1 urinary and serum concentrations of vascular noninflammatory molecule 1 increase in nephrotoxicant-induced renal injury before classic markers. Tacrolimus and cyclosporine used as immunosuppressive agents are nephrotoxic drugs. This study sought to investigate alterations of vascular noninflammatory molecule 1 levels after a kidney transplant. Materials and Methods: This study included 28 renal allograft recipients without acute rejection. Before transplant, and the first and sixth months after the transplant, vascular noninflammatory molecule 1 and creatinine levels were measured in renal transplant recipients using enzyme-linked immunosorbent assay and spectrophotometric methods. Results: During the first month after transplant, we observed a significant increase in vascular noninflammatory molecule 1 levels compared with previous levels (P < .0001). Also, during the sixth month, vascular noninflammatory molecule 1 levels were higher than values previously taken (P < .01), although they were lower compared with the first month values (P = .004). No correlation was found between vascular noninflammatory molecule 1 and creatinine before transplant or during the first and sixth months after transplant. When the patients were divided into subgroups according to the immunosuppressive drugs used, in tacrolimus-treated patients, serum vascular noninflammatory molecule 1 levels were no different from the cyclosporine-administered levels measured at 3 different times. Conclusions: We conclude that serum vascular noninflammatory molecule 1 levels may be low in the end-stage renal failure and transiently increase after transplant owing to transient renal function deterioration, which does not lead to elevation of serum creatinine levels in renal transplant patients. The best treatment method for end-stage renal disease patients is renal transplant (Tx), which provides better survival and quality of life for most patients.1,2 The function and survival of allografts are significantly affected with immunologic and nonimmunologic factors.1 Cyclosporine and tacrolimus are calcineurin inhibitors that can reduce the incidence of acute rejection, and are currently used in immunosuppressive therapy after Tx.3-6 Cyclosporine and tacrolimus therapies have some adverse effects (eg, arterial hypertension and nephrotoxicity).7 Before and after renal Tx, serum creatinine measurements are constantly performed to evaluate renal function for the follow-up of these patients. Conversely, until nephron loss reaches 50%, there is no significant rise in serum creatinine levels. Therefore, more-sensitive markers are necessary to evaluate renal function in renal transplant patients. We aimed to evaluate changes in serum vanin-1 levels in recipients without rejection before and after transplant. This study was performed on 28 renal allograft recipients. All of them maintained stable graft function showing no clinical signs of rejection. The study was approved by the Medical School Ethics Committee. Blood was drawn in the morning after an overnight fast. Serum samples were collected on the preoperative day, and on the first and sixth months after Tx. Serum samples were aliquoted and stored at -80°C until the measurement date. Serum creatinine levels were measured by Jaffe reaction with a commercial kit (Roche Cobas 8000). Vanin-1 in serum was evaluated using a commercially available enzyme-linked immunosorbent assay (ELISA) kit from (USCN LIFE SCIENCE, INC., Houston, TX USA). The detection limit of a vanin-1 kit was 0.034 ng/mL. The high results were restudied by diluting. Initially, transplant patients received tacrolimus + mycophenolate mofetil (MMF) + prednisolone or cyclosporine + MMF + prednisolone therapies. Then, for maintenance treatment, dosage adjustment was made according to serum drug concentrations (tacrolimus, cyclosporine). Statistical analyses were performed with SPSS software (SPSS: An IBM Company, version 20.0, IBM Corporation, Armonk, NY, USA). Results are given as means ± SD. Mixed models repeated measures ANOVA with time included as fixed variable was used to identify differences among times. The examination of the distribution normality of variables used the Shapiro-Wilk test. Correlation analysis was performed by the Pearson product moment correlation analysis. Values for P < .05 were considered statistically significant. Twenty-eight adult renal transplant patients (7 women, 21 men; mean age of women and men, 28.00 ± 12.10 and 31.81 ± 11.30 y; mean age of total patients, 30.86 ± 11.40 y) were included this study. There was no statistically significant difference between the sexes regarding age (P > .05). No significant difference was found between women and men in terms of vanin-1 levels before transplant or at months 1 and 6 after transplant. In the patients, causes of renal failure were glomerulonephritis (n=6), chronic interstitial nephritis (n=6), amyloidosis (n=4), hypertension (n=4), and diabetes (n=3). In the rest of the patients, the cause was unknown (n=5). Eight patients received hemodialysis, 12 patients received peritoneal dialysis, and 8 patients were preemptive before renal Tx surgery. Cyclosporine-based drugs were used in 17 patients, tacrolimus-based drugs were used in 11 patients. In all patients, Tx was performed from living donors. Demographic and clinical features of all patients are shown in the Table 1. At month 1 after Tx, we observed a significant increase in serum vanin-1 levels (3.72 ± 1.97 ng/mL) compared with before Tx values (1.93 ± 1.09 ng/mL; P < .0001) (Table 2). At 6 months after the transplant, mean vanin-1 levels were 2.57 ± 1.64 ng/mL, and they were higher than those of earlier Tx values (P < .01), but lower compared with the first month values (P = .004). No correlation was found between vanin-1 and creatinine before Tx, or at months 1 and 6 after Tx. When the patients were divided into subgroups according to the immunosuppressive drugs used, in the tacrolimus-treated patients, serum vanin-1 levels were no different from cyclosporine-administered levels in 3 measurement intervals (P > .01). This study evaluated changes of serum vanin-1 in renal transplant patients without allograft rejection. Urinary vanin-1 has been evaluated as a renal marker in some studies.11-13 In one study, serum vanin-1 measurement was suggested as a renal injury biomarker.11 In our study, while serum vanin-1 was elevated at the postoperative first and sixth months, vanin-1 levels were low in renal failure patients. Serum creatinine levels were no different in the first and sixth months after Tx. These findings may suggest that serum vanin-1 measured after Tx could predict mild renal toxicity without a rise in serum creatinine. Low vanin-1 values before renal Tx may be the result of renal tubular cell loss in which vanin-1 expression occurs in this time. Renal transplant patients were taken for immunosuppressive treatment particularly during the first 6 months. In this study, patients’ clinical situation and blood levels of the drugs were followed on a weekly basis for the first 3 months and for 2 weekly periods for 3 subsequent months. According to the schedule of drug use, patients took standard dosages of these drugs. Immunosuppressive drugs used on these patients have some deleterious effects on the kidneys. In some studies, it has been found that there were histopathologic differences such as mucoid intimal thickness, tubular epithelial cell microcalcification, and tubular cell shedding in the renal tissues of rats that received these agents.12 In cyclosporine and tacrolimus doses used in these patients, nephrotoxicity generally was not observed as sufficient to cause an increase in creatinine levels. However, chronic administration of these drugs may cause tubular and glomerular injury and in this time, proteinuria occurs, and later, serum creatinine levels increase. We could not find any study regarding the correlation between serum creatinine and vanin-1 values. Fugmann and associates investigated probable disease markers in an animal model of diabetic nephropathy.13 In that study, rats were perfused with a reactive ester derivative of biotin at various times after streptozotocin treatment. After, kidney tissue proteins were quantified, and it was found that concentrations of urinary vanin-1 were elevated in diabetic rats with macroalbuminuria compared with those with normal albuminuria. We did not include patients with chronic allograft nephropathy in our first study. If later studies are adjusted to include chronic allograft nephropathic patients with elevated creatinine levels, alterations of vanin-1 levels can be observed, and it can be evaluated whether vanin-1 is superior to creatinine in these patients. Serum vanin-1 levels may be low in end-stage renal failure and transiently increase after transplant owing to transient renal function deterioration, which does not lead to elevation of serum creatinine levels in renal transplant patients. Kumar R, Brar J, Yacoub R, Khan T, Zachariah M, Venuto R. Assessment of cardiovascular risk factors after renal transplantation: a step towards reducing graft failure. Transplant Proc. 2012;44(5):1270-1274. doi: 10.1016/j.transproceed.2012.01.111. Batabyal P, Chapman JR, Wong G, Craig JC, Tong A. Clinical practice guidelines on wait-listing for kidney transplantation: consistent and equitable? Transplantation. 2012;94(7):703-713. doi: 10.1097/TP.0b013e3182637078. Zadrazil J, Horak P, Zahalkova J, et al. Improvement of cardiovascular risk factors and cosmetic side effects in kidney transplant recipients after conversion to tacrolimus. Biomed Pap Med Fac Univ Palacky Olomouc Czech Repub. 2009;153(1):67-73. Gummert JF, Ikonen T, Morris RE. Newer immunosuppressive drugs: a review. J Am Soc Nephrol. 1999;10(6):1366-1380. Mayer AD, Dmitrewski J, Squifflet JP, et al. Multicenter randomized trial comparing tacrolimus (FK506) and cyclosporine in the prevention of renal allograft rejection: a report of the European Tacrolimus Multicenter Renal Study Group. Transplantation. 1997;64(3):436-443. Millis JM, Woodle ES, Piper JB, et al. Tacrolimus for primary treatment of steroid-resistant hepatic allograft rejection. Transplantation. 1996;61(9):1365-1369. Ponticelli C. Medical complications of kidney transplantation. In: Ponticelli C, ed. Immunosuppressive drug-related complications. 1st ed. Boca Raton, Taylor & Francis; 2007: 125-158. Berruyer C, Pouyet L, Millet V, et al. Vanin-1 licenses inflammatory mediator production by gut epithelial cells and controls colitis by antagonizing peroxisome proliferator-activated receptor gamma activity. J Exp Med. 2006;203(13):2817-2827. Duprè S, Graziani MT, Rosei MA, Fabi A, Del Grosso E. The enzymatic breakdown of pantethine to pantothenic acid and cystamine. Eur J Biochem. 1970;16(3):571-578. Pitari G, Malergue F, Martin F, et al. Pantetheinase activity of membrane-bound Vanin-1: lack of free cysteamine in tissues of Vanin-1 deficient mice. FEBS Lett. 2000;483(2-3):149-154. Hosohata K, Ando H, Fujiwara Y, Fujimura A. Vanin-1: a potential biomarker for nephrotoxicant-induced renal injury. Toxicology. 2011;290(1):82-88. doi: 10.1016/j.tox.2011.08.019. d'Ardenne AJ, Dunnill MS, Thompson JF, McWhinnie D, Wood RF, Morris PJ. Cyclosporin and renal graft histology. J Clin Pathol. 1986;39(2):145-151. Fugmann T, Borgia B, Révész C, et al. Proteomic identification of vanin-1 as a marker of kidney damage in a rat model of type 1 diabetic nephropathy. Kidney Int. 2011;80(3):272-281. doi: 10.1038/ki.2011.116. Galland F, Malergue F, Bazin H, et al. Two human genes related to murine vanin-1 are located on the long arm of human chromosome 6. Genomics. 1998;53(2):203-213. Jansen PA, Kamsteeg M, Rodijk-Olthuis D, et al. Expression of the vanin gene family in normal and inflamed human skin: induction by proinflammatory cytokines. J Invest Dermatol. 2009;129(9):2167-2174. doi: 10.1038/jid.2009.67. Acknowledgements: The authors have no conflicts of interest to declare.